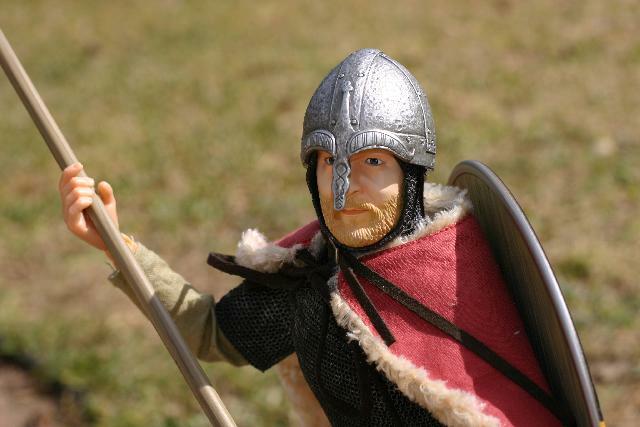 This page contains photos and a review ofDragon Model'sOlaf the VikingOlaf is one of a new series of bendable, posable 1/6 scale (30 cm or 12")figures with well done historical clothing and accessories.Other figures in Dragon Models "Barbarian" series includeErmanarich the Goth, Subadai the Mongol, and Atilla the Hun.I purchased Olaf via mail order fromMichigan Toy Soldiers and Historical Miniaturesfor $39.95. First, a bit of history. If you played with G.I. Joe( "Mom, they're not dolls, they're action figures!" 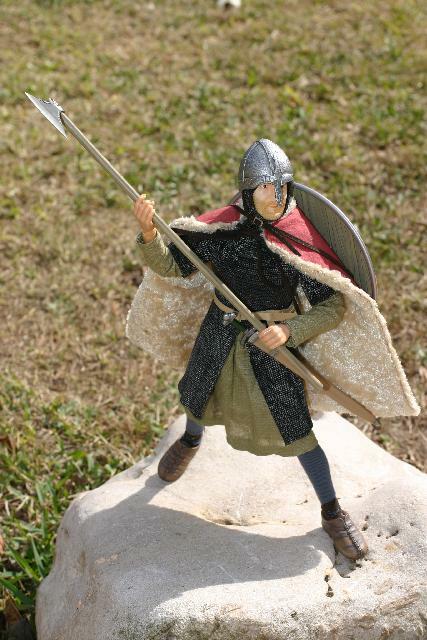 )when you were younger, you probably know they were extremely popular in the 1960s,and they evolved into the Adventure Team in the 1970s.Then they changed into 3 3/4" (10 cm) figures in the 1980s.Hasbro's 12 inch (30 cm) action figures returned in the 1990sand are as popular today as ever. In the 1990's companies such as Dragon Models Ltd.(DML), 21st Century Toys,Dragon in Dreams, and others started producing 1/6 scale miniature posablefigures.Initially, these were not as nice as G.I. 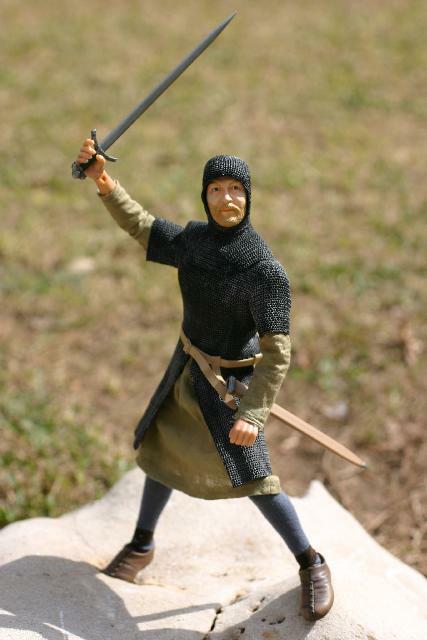 Joes, with somewhat plastic looking facialsculptures, odd colored flesh tones, thin fabrics, and other second-rate features.However, with popularity and perseverance, eventually the figures from Dragon Modelsstarted to outshine the Hasbro G.I. Joes, such that nowadays anyone lookingfor historical accuracy and excellent detail should look at all companies. Here is Olaf stripped to his gray stretch tights.As you can see, he is quite flexible.He also has very nicely painted shoes with real black leatherleggings - an excellent detail. Dragon Models has changed its 1/6 scale miniature body style over the years.Olaf's body has quite a few more features than a Hasbro G.I. Joe.For one, there is a hinge at the bottom of the rib cage as wellas by the hips. This makes it much easier for the figure to do a crunchas shown. The femurs are connected to hip with a multi-way hinge androtator that is about the same flexibility as the G. I. Joe ball and socket.The knees are two hinges with a nice knee cap molded in the middlewhich is much better approximation of the human knee than a G.I. Joe.Ankles have hinges and rotators that are very posable. Olaf's upper body has plenty of hinges and rotators.There are detents in the shoulder joints that make a loud ratcheting sound as you posehim.His neck and head are ball and socket with a side-to-side twist, but becauseof the low connection of the head to the neck, Olaf cannot look up and down very far.He also has a bald head - a very nice feature. This allows a replaceablehair style.It also allows his bald head to fit better into his mail coif and helmet.Excellent, I like bald figures. However, notice his beard is molded into hisface. 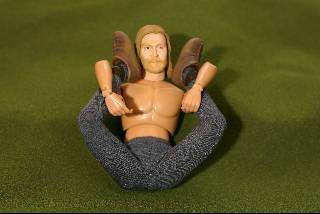 The hands are hard but flexible rubber in two poses. I do not know if they arereplaceable, but they flex just enough to get items into his hands.I wonder why Olaf needs a detached trigger finger, maybe to test the soup. Unlike a G.I. Joe, Olaf's body is mostly hinges and the legs are not connectedvia elastic cord. Thus, Olaf holds most positions very well.However, as is with many older G.I. Joes, my Olaf figure is quite "loose". Often, thereis not enough friction in the joints to hold against gravity in certain poses.So, like an old G.I. Joe, Olaf can fall over in many poses.I don't know if this looseness is a general problem or I just got a randomloose sample figure. 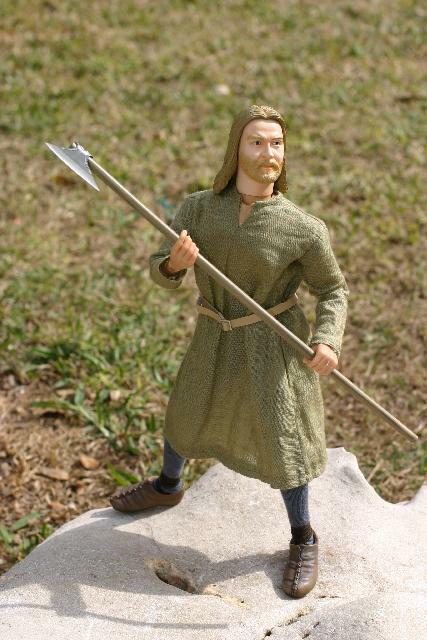 Here is Olaf in his green tunic and his leather belt.At this stage of dress, he could easily representmany historical figures.I think he looks like the stereotypical Jesus. However, this man preaches with a battle axe!It is a very nice long handled axe.This is the weapon of the huskarls - the King's body guard.It was also used in the Dark Ages shield wall formation.As the enemy lines clashed, each side tightly formed upmen and shields so no spears or swords could be swung.A good long handled axe could be swung over the tops ofthe shield wall, crashing down on the heads of the enemy.The longer the handle, the farther the reach over the wall. Olaf's axe looks very nice. 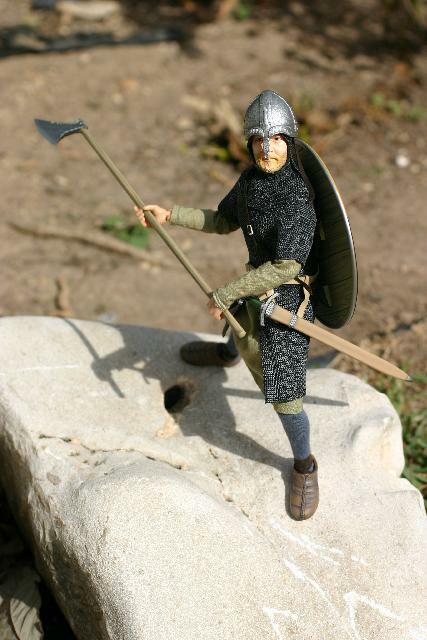 The head is small and compactwhich is historically correct.Unlike fantasy barbarian axes, the real battle axe was smallso you could swing it in a crowd. Here's Olaf with more of his accessories.Olaf has a rubber mail hauberk (long shirt) and coif (hood).These are molded in black rubber and dry brushed with silver paint.The molded pattern is very nice, even picking uphistorical weave patterns on the coif. However, like the old G.I. Joe scuba suits, the rubber mail issubject to tearing.I tore the front leg seam when I tried to remove the mail over his head.It is best to undo the rear laces and take the mail off down his legs.Another minor nit is his hauberk has a front center leg seam which iswhat horsemen usually wear to allow seating in a saddle.A foot soldier usually has two side seams to allow better leg movementwhen running. The sword, the scabbard, the belt, and the sword frog are nicely done.My one complaint is the sword handle is a little thin for Olaf's hands.A few wraps of leather tape should fix that. Notice the facial sculpt in this picture.Definitely very expressive and life-like.One of the nicer figure faces. Here is a photo with a helmet and shield.Olaf's helmet is a spangenhelm with brows and nasal.It is black rubber painted with silver paint. 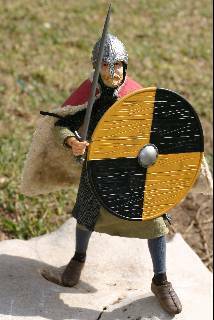 The shield has two straps for the arm, and one longstrap for wearing slung over the back (as in this picture).The straps are leather with tiny metal buckles. Theyare somewhat fragile. I'm sure kids will break them. But theylook good.The shield is somewhat non-historical.There is no handle behind the central boss.At least with all the straps you can still put it into place.The shield is a bit big and heavy for Olaf.As, I said earlier, it might be because I have a loose Olaf,but this shield can really pull him out of position or makehim fall over. Now Olaf is fighting mad! He has his shield ready and his sword out.Again not the enormous size of the shield.Still, it is nicely painted. His cape is excellent.The inside has a tan acrylic fur.The outside is a rich red fabric.There are two nice long leather straps to tie around his neck. 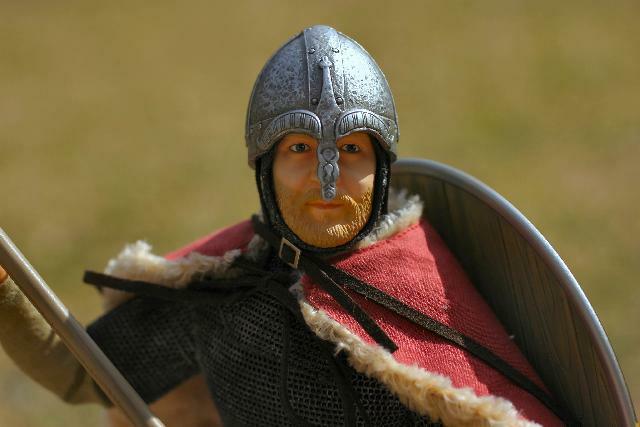 He looks great here -the stereotypical Viking ready for a fight.He would fit right into the Hollywood movie The Vikings with Kirk Douglas, Tony Curtiss, and Ernest Borgnine. Waaaaaaaaaaaah!Fully clad and fighting mad.Killing Saxons, Picts, Estonians, Muscovy, Frisians!Waaaaaaaaaaaah!I am Olaf! Overall, I think Olaf is an excellent figure for any action figure collector,historical enthusiast, or Viking fanatic.Positive features are his good facial sculpt, highly posable body, excellentclothing accessories, and overall good historical accuracy.Negative features include a loose body, easy-to-rip rubber mail hauberk,and somewhat fragile leather straps.What's nice is that with the plethora of clothing and accessories, several Olaf figures canbe purchased and by varying the dress, you can have several different-looking figures.I wish Dragon Miniatures the best of success with its ancient "Barbarians" lineand look forward to more releases in the future. Last modified: Thursday, 09-Jun-2011 12:55:18 MST.